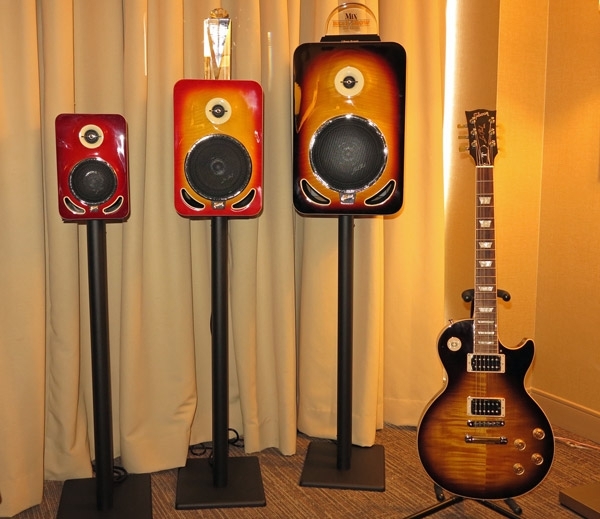 People were going gaga over the Gibson Les Paul Reference Monitors, which debuted in the Gibson tent at CES before debuting at NAM and Frankfurt. In their US Consumer audio show premier, which celebrates the Les Paul Centenary, the GSLP 4" ($1198/pair), GSLP 6" ($1598/pair), and equally poetically-titled GSLP 8" ($1998/pair) displayed their pedigree as reference monitors suited for both home and studio. I found the balance a bit bright and sharp for my taste, but there was much to admire in the sound. As might be expected, the 8" model has the biggest and most natural-sounding midrange of the three. 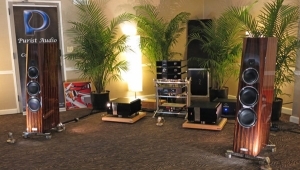 I must have missed Dale Harder's intriguing Cleveland-made HHR Exotic Speakers when they were last shown at RMAF 2010. 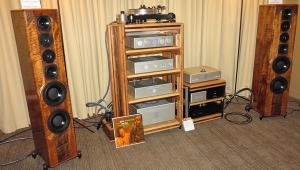 Sold only on the web, the HHR Exotic Speakers TLS-1 towers (base price $15,000/pair), paired with hardly burned in Conrad-Johnson's ET5-SE preamplifier ($9500) and MF2550A amplifier ($7800), had a rich midrange but a somewhat brash top. Nonetheless, there was something unique about the HHR Exotic Speakers TLS-1s' presentation that made me hope to encounter them again before the year is up. Harder says the loudspeakers, whose 360° dispersion sound emanates entirely from their Walsh-style, single-piece, 12" cone drivers, are "not fussy about room acoustics." If that is the case, then the brightness I heard can't be blamed on the room. Perhaps by Day 3, when the electronics have broken in more, it will be gone. Designed for 300400 ft.2 rooms, the speakers have no crossover. 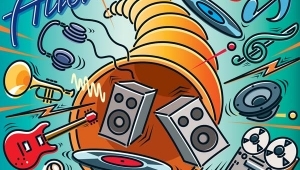 Frequency range is 24Hz22kHz, senstivity is 8788dB, and weight is 187 lbs/each. Finally, in the larger Raidho room on the 5th floor, I encountered a lovely midrange married to a fine, non-fatiguing top end. The astounding soundstagehuge, open, airy, and seemingly without boundarieswas perhaps due in part to the concave backdrop behind the speakers. A recording of "Il Ladro" by Angelo Branduardi sounded marvelous, Although I missed some of the richness in the middle of mezzo-soprano Christa Ludwig's voice on her familiar-to-me early recording of Mahler's Lieder eines fahrendes Gesellenthe voice I hear on my own reference system, and heard on Magico's M Project loudspeakers and Soulution electronics during a recent visit to Magico headquarters in Hayward, CA, is fatter and richerthe overall beauty of the sound could not be denied. Doing the honors were Raidho D3 loudspeakers ($66,000/pair), the brand new Aavik U-300 integrated amplifier with 24/192 DAC ($30,000), Naim CDX2 transport ($7000), Ansuz Diamond cable, Mainz8 Diamond power distribution, and Raidho rack. 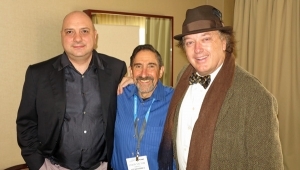 If I had visited AXPONA as a consumer rather than as press, I would have spent an hour luxuriating in the sound of the Goerner Audio room. Reinhard Goerner, who got into this business after he found himself consumed by the sound of the Beethoven Violin Concerto that he heard and learned to sing from memory at age 8, assembled an absolutely beautiful-sounding system. At its heart were the Italian Grandinote Shinai dual-mono integrated amplifier ($16,000), whose unique, no feedback circuit topology outputs 37 watts/channel in pure class-A; brand new Grandinote Volta music server ($12,000); Audio Physic Avantera Plus+ loudspeakers ($28,000/pair); superb full-range and ultimately transparent Nordost Valhalla 2 cabling; and Creaktiv Midi Reference audio rack ($5500). Playing the piano version of Beethoven's Violin Concertoyes, there is such a thing, arranged by BeethovenGoerner invited me to sit in the sweet spot. Given that there was no room treatment, and all reflective surfaces were uncovered, the speakers were extremely toed in to minimize the effect of first-order wall reflections. The by-product of this was a huge, enveloping soundstage. But beyond that, the sheer musicality of the sound, just a bit toned down on top but very clear and ultimately seductive in the midrange, was so, so beautiful. Switching to MA Recordings' LP of Sera una noche, which we heard courtesy of a Funk Vector V turntable ($2595) with Funk FX-III 9" tonearm ($2695) and London Jubilee phono cartridge ($3000) and the Grandinote Celio phono stage ($8750), all I could do was marvel at the gorgeous midrange and really nice top. Switching to a different track from the same recording, this time in 176.4/24 file format, I was entranced by the fabulous depth of the presentation. This system was a triumph. 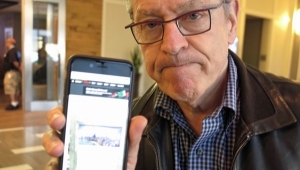 I sure hope I encounter Grandinote electronics again in Munich. 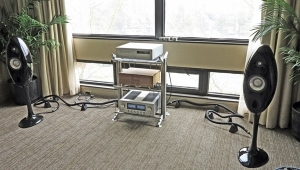 JansZen introduced the new 34"-tall Model zA2.1A-HP full active electrostatic hybrid compact floorstander. The speaker claims 20Hz low extension (3dB in-room) and 108dB peaks. Crossover and EQ are electronic. There are four pushbutton-selected sonic profiles to suit various listening situations, and others can be custom-programmed. Base price is $9950/pair, with additional $2995 for internal bi-amping, $880 for the extended bass, and various prices depending upon wood finish. The model I heard, which cost $14,500/pair shipped, produced a beautiful midrange. Unfortunately, David Janszen was experiencing some communication problems between his PC source and exaSound e20 4xDSD DAC which resulted in downsampling some of the music from DSD to 88.2k PCM. Once the problem was caught and hopefully rectified for the rest of the show, the beautiful, rich midrange remained, and all trace of wiriness vanished from the top. Note that the exaSound DAC drove the input sensitivity adjustable speakers, with only it between the source and the zA2.1A-HP loudspeakers. The strangest arrangement of Ravel's Bolero known to humankind was polluting the air as I entered the room that paired the excellent Kaiser Kawero loudspeakers with Goldmund's brand new Telos 360 Universal Mono Amplifiers (listed at $40,000/pair, but available for less "on the street," which means from retailers who are clearly a distinctly different entity than the Norteño gang members who hung out on the streets of my old East Oakland hood). The Telos 360 amps are a 9th generation refinement of Goldmund's original amplifier schematic, and were mated with Goldmund's Mimesis 11 preamplifier (list $10,000, street price around $7000), and Eidos 17 universal player (list $13,000, street price around $8000), as well as an Aurender music server ($17,900). After a bit of one of Malcolm Arnold's overtures, superbly recorded by Keith O. Johnson, I quickly grabbed some familiar classical vocal music to further get a handle on the sound. Depth was excellentthe air was marvelousand bass control was excellent. Even though the sound was a bit toned down on topI missed the radiance at the top of Elly Ameling's wonderful sopranothe midrange was superb. I look forward to spending more time with these babies at a later date. 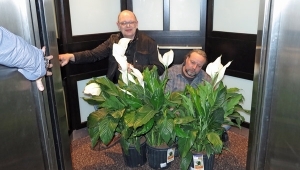 We've covered the surprisingly good sound of Madison Fielding outdoor, planter box-concealed loudspeakers before. Now they're available in sustainable, reforestable teak ($5000/pair), as well as in two teak monitor configurations. The music playing was decidedly easy listening, as in best ignored and spoken over, which is probably how you would use the speakers in an outdoor setting. The sound sure beat the "could you please turn that down" irritation-masked-as-music, iPhone-sourced MP3s that my brother-in-law, Michael, plays at our family gatherings beside his suburban pool. Michael, are you listening? 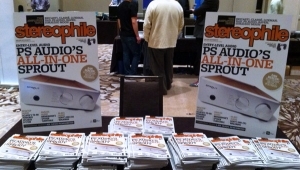 Stereophile having covered the premier of Gershman's latest loudspeaker in Montreal, my attention turned to their LVC vibration control devices. These babies, which use opposing magnets to float devices, come in three models: the LVC 40 ($359/set of 4), which together can support up to 40 lbs; LVC 100 ($389/4), which together can support up to 100 lbs, and LVC cable floater ($95/each), which simultaneously lift and float cables. I'm eager to experiment with these babies. I did not know that Conrad Johnson made a "SE" version to the ET-5 preamp? That is certainly worth checking out. Previously, I have auditioned the ET-3SE and it is superb! If the link prices of $599, $799 and $999 are correct, that's a helluva good price for a beautiful, nice sounding speaker. Pro buyers are more likely to purchase odd numbers. That manufacturer's website should make it clear their prices shown are, I assume, the price for one. Constructive suggestions are not only appreciated, but also heeded :-) Thank you. Also, your coverage focused on the JansZen floorstanders, but I think I was more blown away by what the monitors could do considering their size. Both were amazing in their capabilities considering their footprint.